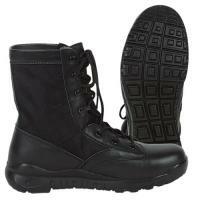 Hike further, kick harder and run faster with the Deluxe Jungle Boot from Voodoo Tactical. Featuring a micro fiber, poly-leather fabrication, the Jungle Boots offer complete waterproof protection for the wettest environments on earth. A molded polyurethane sole coupled with the most aggressive tread Voodoo Tactical has to offer, keeps wearers on their feet at all times. An EVA insole delivers support to all the right places and absorbs impact shock, eliminating the crippling effects of foot fatigue. Designed to provide superior comfort right out of the box, the boots combine poly-leather around the foot with a soft fabric around the ankle, resulting in unparalleled mobility and flexibility. The ultra-breathable fabric allows cooling air to continually circulate around the foot, resulting in all day comfort on the hottest days and muggiest environments.